Whether you are after high end luxury or affordable, clothes or electronics, Singapore has a shopping center or district suited to your needs. Orchard Road is where some of the best shopping in central Singapore can be found, particularly for high end and designer clothing brands. The wide avenue is lined with a series of large shopping malls comprising literally thousands of shops. If you are on a budget or after something a little different, head to Chinatown or Little India. As well as being the place to go for the best Indian cuisine in Singapore, Little India is a vibrant, bohemian district of the city with some of the city’s best-preserved colonial architecture and various temples, churches and mosques. The 24-hour Mustafa Centre is one of the city’s best budget shopping centers; the pharmacy section on the ground floor is massive and you can also buy gold jewellery and clothes. Sim Lim Square (or simply SLS) is a huge shopping center devoted to all things electronic, especially cameras and computers (and their parts). It’s a good idea to have an idea of what you should be paying however, as some vendors will be looking to rip you off. 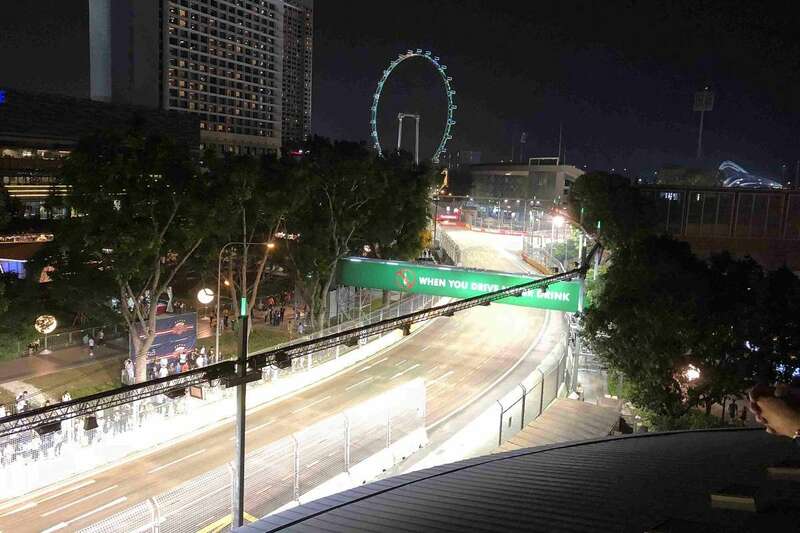 Within walking distance of the Marina Bay circuit, Chinatown is a good base for Grand Prix weekend, particularly if you are on a budget as there are lots of hostels and cheaper hotels in the vicinity. There’s interesting architecture, excellent shopping centers (many with food courts), an outdoor market and lots of tasty Chinese restaurants, as you would expect. 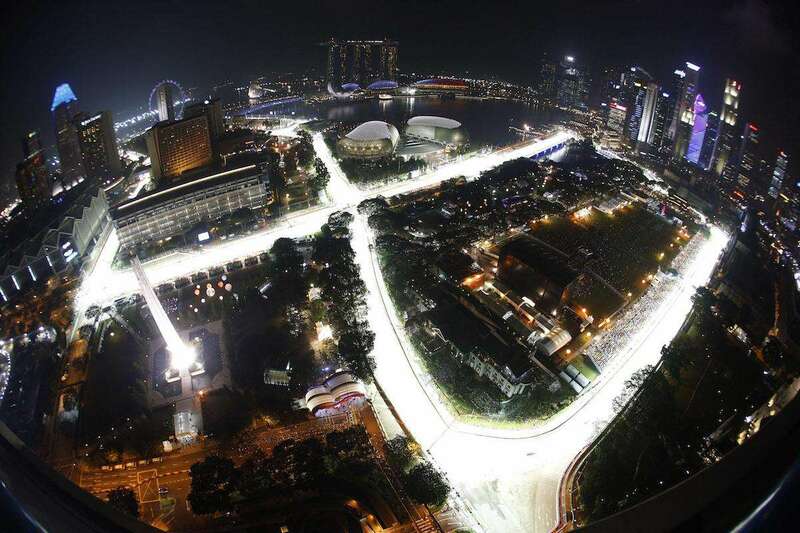 If you’ve still got some energy after a night at the track, then Singapore’s nightlife is always buzzing. Clarke Quay is the premier nightlife destination in Singapore, and is located a short stroll from the Padang (Zone 4) area of the circuit. It’s home to countless places where you can drink, dance and party, many of them offering alfresco dining by the river with the amazing backdrop of Singapore’s skyline. 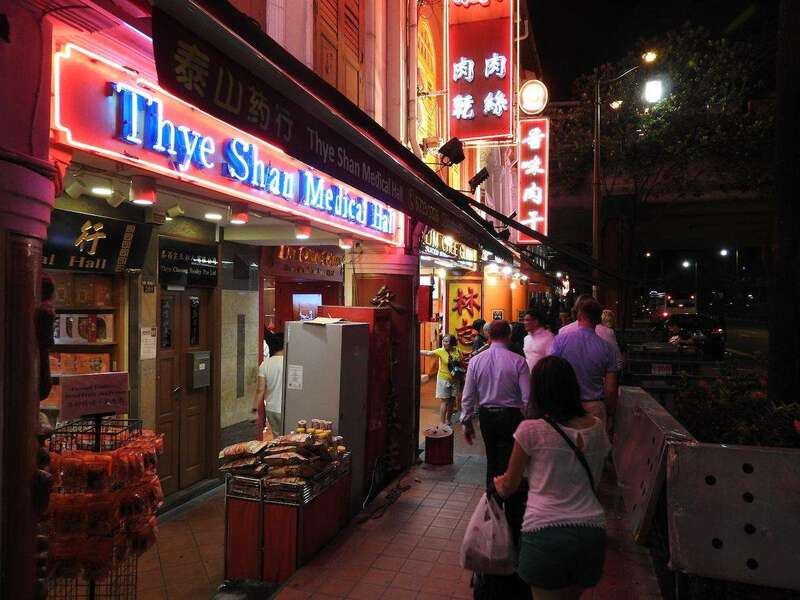 The city’s other harbor-front areas, Boat Quay and Roberston Quay, are also worth a look. Singapore’s newest architectural landmark Marina Bay Sands is not only a huge hotel, but also the city’s one and only casino. Don’t forget to take your passport if you want to gamble. Marina Bay also has restaurants galore, a vast shopping center and an incredible ‘skypark’ with that infinity pool. Entry to the pool area is for guests only, but you can get limited views for free (only on the non-city side) or pay for drinks and skyline views at CE LA VI bar (see below). If you’re ready to mix with the F1 jet set (and can foot the bill), then there are some exclusive F1-themed parties held on Grand Prix weekend in Singapore: Podium Lounge & Amber Lounge are the biggest. You may even get to meet a driver or two. Nightclubs open late and can be found all over the city; there is always plenty of top-name DJs in town for the Grand Prix. Beautiful people are also in abundance at some of the cool rooftop bars of the Marina Bay hotels (CE LA VI) and in the Financial District or you can head to Club Street in Chinatown for fashionable wine and cocktail bars. We recommend 1-Altitude, the highest rooftop bar in the world atop the 282 meter One Raffles Place office building. It occupies the top three floors and as well as the outdoor bar, also includes a restaurant and sports bar. Make sure you reserve your entry in advance on Grand Prix weekend. The views from the top of Marina Bay Sands are awesome, but why pay $23 SGD for entrance to the Skypark when you can go to CÉ LA VI bar one level higher and pay the same with a cocktail included in the deal! You’ll need to pay $20 per person on the ground floor, but this is credit towards your food and drinks. We paid $23 each for our cocktails. Enjoy! Sentosa Island is one of Singapore’s leading tourist attractions. As well as golf courses, shopping and 5-star hotels, you will also find the Universal Studios Singapore theme park, part of the Resort World development. Other attractions on Sentosa Island include the Tiger Sky Tower, Underwater World & Dolphin Island, Butterfly Park & Nature Kingdom. Megazip Adventure Park and a wave pool. The island is connected to the mainland via a causeway and can be reached from the city centre in just 20 minutes. The easiest way to get to Sentosa is to take the MRT – head to Harbourfront station, the terminus of both the Northeast and Circle lines. From there, you can either walk or take the scenic cable car. Learn more on the official Sentosa Island website. The Singapore Flyer, the world’s second-tallest Ferris Wheel, is located within the circuit. The 165-metre tall wheel opened in 2008 and offers amazing views, at day or night. 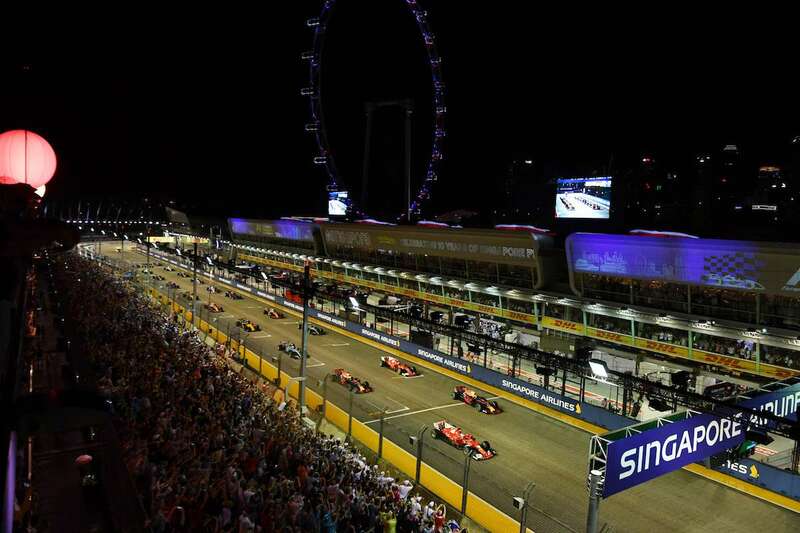 Ticket prices start at $33 SGD, but F1 fans can enjoy free rides on the Singapore Flyer on Grand Prix weekend, providing you have Zone 1 or Zone 2 access (information correct as of 2018). More information can be found here. Learn more: Your Singapore, the official site of the Singapore tourism website has a wealth of information on things to do and see in the city state.Time Out Singapore is worth checking for shopping, restaurants, nightlife and event listings. What are your Singapore travel tips? Leave a comment! Where’s the best attractions this week for the build up to the race?? Can we visit the pits? Hi Taft, you should be able to take a walk down the pit straight to see the preparations. I would also recommend a ride in the Singapore flyer. Hi, my husband and I are travelling to see the 2018 Singapore F1. We have purchased the Combination Stamford tickets, we will be able to access the singapore flyer at all? Hello, the Singapore flyer is in Zone 2. You can only enter this zone on Friday according to your Stamford Combination ticket. The good news is that you should be able to ride the flyer for free on this day. Hi..I have a zone 3 bay grandstand ticket for sat day Sunday..can I catch the preparations and how? What would my 8yr old enjoy most? Do you have any tips for a gift experience that I could book for my partners birthday whilst we are out there this year? His birthday is on qualifying day – Saturday 21st Sep 2019. 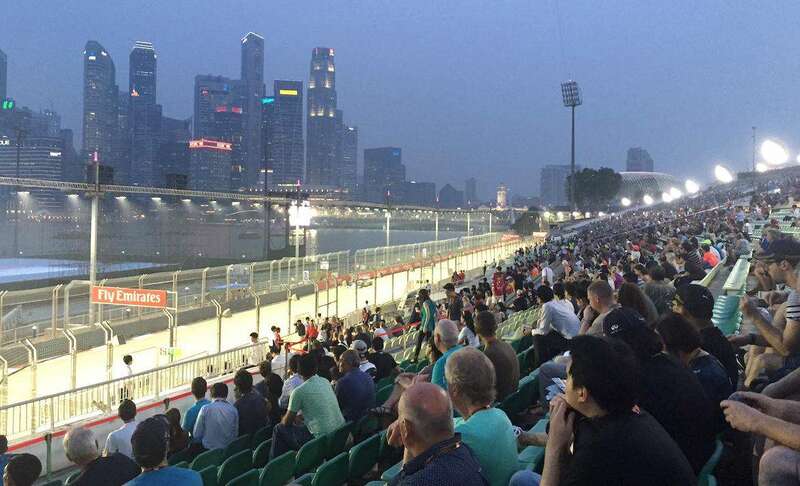 I looked at pit walks but it seems you can only apply for tickets to that if you are a Singapore resident? And I’ve looked at Supercar track drives which a lot of companies say you can do on part of the circuit but I assume this wouldn’t apply over the race weekend? I also looked at hospitality options but we were going to go for Turn 2 tickets which only have a 3-day option, so would I have to pay that plus hospitality on top for the day, and effectively be paying for seats that we didn’t use for 1 day? It doesn’t seem like you can buy Zone 1 tickets by the day or just pay a ‘top-up’ on your grandstand seat to upgrade to hospitality for 1 day? Hi we are also visiting for this year’s F1 and would like to find out if there is any opportunity for a pit walk if you are not a Resident.